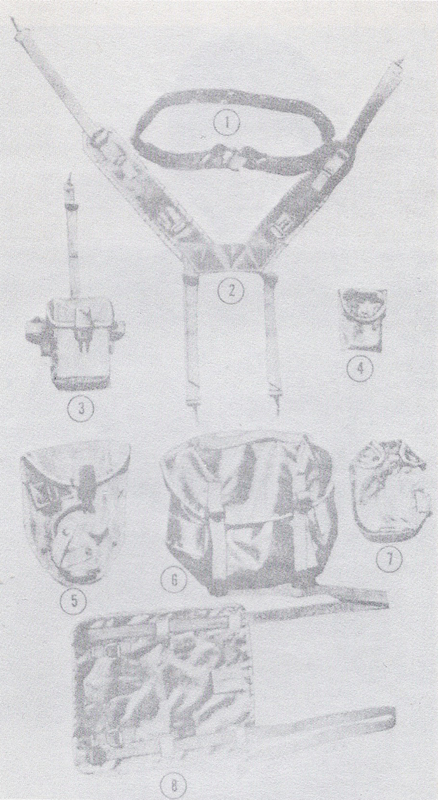 Components of the Lightweight Load-Carrying Equipment are similar in design to components of the standard M1956 individual load-carrying equipment. Because nylon materials and aluminium hardware are lightweight, they are used where possible in lieu of cotton materials and brass or steel hardware. The nylon materials are water resistant, retain less moisture and dry faster. In an effort of reducing the weight of the M-1956 cotton equipment a set of equipment was made substituting available nylon materials for the cotton. TM 10-276. 1970. Chapter 4. TM 10-8400-201-23. 1970. Chapter 6.